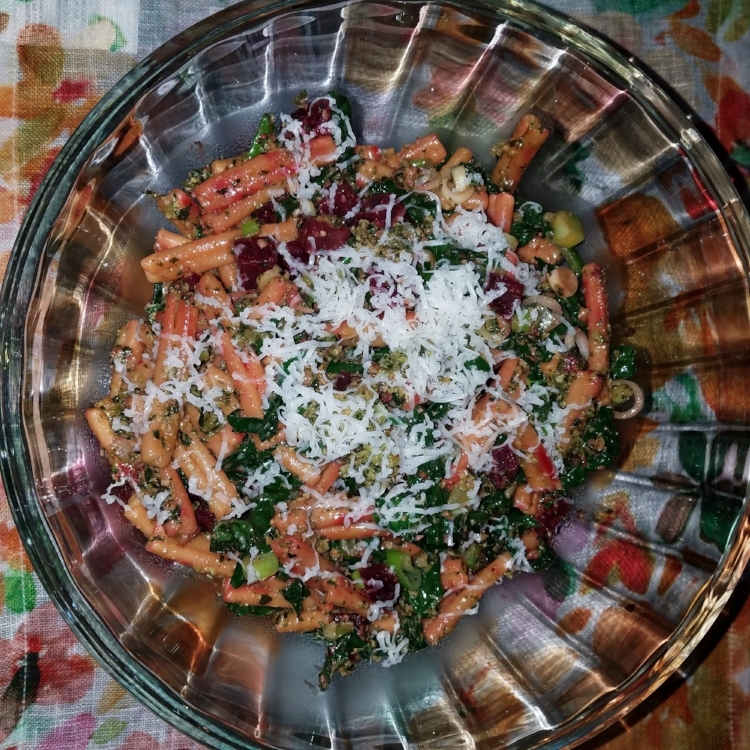 Made with fresh summer ingredients like basil, kale, beets and green onions; it is good slightly warm or chilled making it a great leftover / make ahead dish for the week. Here’s how you can do it too! 2 cups short dry brown rice pasta (USDA organic). [A Fresh Wellness Mindset will tell you why it is utterly important to choose certified organic pasta] I used casereece because it looked interesting and is new to me. Penne, elbows or fusilli would also work well. 1 large beet diced and steamed until just tender. If you want to short cut it, use pre-cooked beets. ½ cup pesto Substitute basil for the parsley in this recipe. Alternatively to pumpkin seeds, you could use walnuts. While the beets are steaming (about 20 minutes) make the pesto. When the beets are fork tender, remove them to a glass bowl for room temperature cooling. Keep the beet water; add more water to boil the pasta. The beet water has some good nourishment the pasta can absorb and you don’t need to get another pan dirty. While the pasta is boiling get your protein ready. I served grilled loin lamb chops which were done in about the same time including the grill heating. Add a drizzle of balsamic vinegar to lamb chops when done. Fish and chicken will complement the salad nicely too. While al dente (ever so slightly firm) is the preferred method for pasta, I like pasta salad pasta cooked another minute or two. You don’t want it falling apart, just a wee bit more tender. In the pasta pan, add a couple tablespoons of olive oil, and heat to low medium. Add green onions, dash of herbamare® and oregano. When the green onions begin to soften add the kale ribbons. Stir and cook on low medium until kale begins to wilt. Stir in the diced beet. Add the pasta and pesto. Gently fold the ingredients and turn the heat down to low while the pesto incorporates. Turn off the heat. Transfer to a pretty bowl. Shave goat cheese over the top. Be ready to taste perfection. Serve! Contact Tam for a complimentary 15 minute conversation and find out if her approach is right for you.